After a long day of work in Atlanta comes the dreadful game of traffic frogger, and the top thing on your mind is getting yourself, and your loved ones, home safely. You’re thinking about going home and recovering from a long day of work by doing a whole lot of nothing, and then, a little more of nothing. All of a sudden you are faced with an unexpected car accident. Now what? This can leave you feeling scattered and unsure of what to do. It’s virtually impossible to be “fully-prepared” for a car accident, but here are some tips to help better prepare you for an accident BEFORE it happens. Keep a safety kit in your car including: a first aid kit, flashlight, equipment for keeping traffic clear of the accident (such as cones, emergency flares, etc.). Keep important documents ready (driver’s license, insurance information, vehicle registration, health plan info, etc.). Always keep an extra phone charger in your car. Keep loose items in the center or glove box to avoid items getting lost or causing damage. Move to a safe area, such as the shoulder of the road, and turn on your hazards to notify other drivers. Stop the vehicle and get out. Make sure it’s safe to get our of your car before opening your door. Stay at the scene. Leaving the scene of an accident could leave you facing serious criminal penalties. Check on others involved. Make sure to check on all parties involved, including drivers, passengers, and pedestrians, before assessing property damage. Call 911. Do not hesitate to seek medical attention, even for a “minor” accident. Minor symptoms such as dizziness need to be checked out by a health care professional. If someone is unconscious or has neck/back pain, do not move them until a qualified medical professional arrives. Call the police. 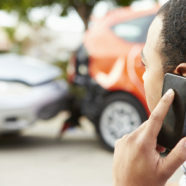 A fender bender may seem like a seemingly minor incident, but it is important to call the police because accident reports prove invaluable when it comes to insurance claims and lawsuits. Do not admit guilt and do not apologize for anything at the scene. At the time, it may seem natural to get out of your car and shout, “I’m so sorry I ran that red light.. are you okay?”, but do not do this. You may be admitting legal liability for what happened. Do not unnecessarily admit guilt. Gather and exchange info — including driver and passenger names, numbers, addresses, license plate numbers, insurance info, makes and models of all vehicles involved, eyewitness contact info, and the name/badge number of the responding police officers. Document the scene. Use your phone! Take as many pictures as possible of the accident scene. This will be crucial during the claims process. Keep track of your medical treatment and records. Be wary of early settlement offers. Consult a Personal Injury Attorney before signing any settlement documents because physical injuries may not have been fully treated and you want to make sure you are compensated for your injuries. Interested in a motor vehicle accident attorney? If you are seeking an attorney for a car accident case, we can help! Accident cases need to be handled delicately and by a professional, so let the Law Offices of P. Kent Eichelzer III help you today. We have offices convenient to Woodstock, GA and Marietta, GA. Don’t wait another minute; contact us today to set up a free consultation.